Welcome to new idyllic retreat that evokes a rustic-elegant vibe—a perfect nod to the rich and pioneering heritage of the Pacific Northwest. Consider this your new go-to vacation base camp when pining for serene surroundings located just around the river bend from Magic Kingdom park. Standout features include a full range of accommodations with modern amenities—from Deluxe Studios to 26 waterfront Cabins with wraparound porches. Stay in a Disney Deluxe Villa with just-like-home amenities like a kitchen, washer, dryer and separate bedrooms. These outstanding accommodations go beyond the traditional hotel room. 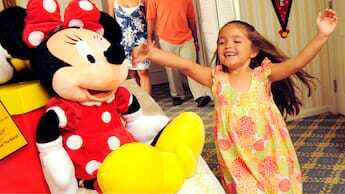 Designed with comfort in mind, Disney Deluxe Villas are ideal for families and larger parties. A little more than you need? Consider booking a Deluxe Studio, which includes a kitchenette and queen-size sleeper sofa—a great option for smaller travel parties and shorter stays. Check availability and nightly rates. Discover details that harken back to a storied railway past, present-day luxuries and years of future adventures—all tucked away down the hidden pine trails off Bay Lake. The main lobby of Disney’s Wilderness Lodge is just steps away from the full range of modern, nature-inspired accommodations at Copper Creek Villas & Cabins. Whether it’s a night spent relaxing by the lobby’s 82-foot-tall layered stone fireplace, or venturing out to delight in the near endless action of the close by Walt Disney World Resort theme parks, you and your family will find that this wilderness retreat is a magical backdrop for the timeless vacation tales you’ll continue to tell, year after year. Dip into a pool area that suits your mood—choose from the playful Copper Creek Springs Pool or the easygoing Boulder Ridge Cove Pool. Follow the bubbling Copper Creek to discover a dazzling heated pool surrounded by nature. Here, you can zip down an exciting 67-foot waterslide built into rocks and relax in hot and cold whirlpool spas. Children can have a blast exploring the newly added aquatic play area. Nearby, Geyser Point Bar & Grill offers refreshments and snacks for you to savor at a patio table or on a lounge chair by the pool. Learn more about Amenities & Recreation at Copper Creek Villas & Cabins at Disney’s Wilderness Lodge.